Giveaway is now closed! Congratulations Ashley! Winner also listed on Winner Page under the about section. I don’t know about you and your kids but I can atest that myself and my kids alike are so excited for April 1 to get here. 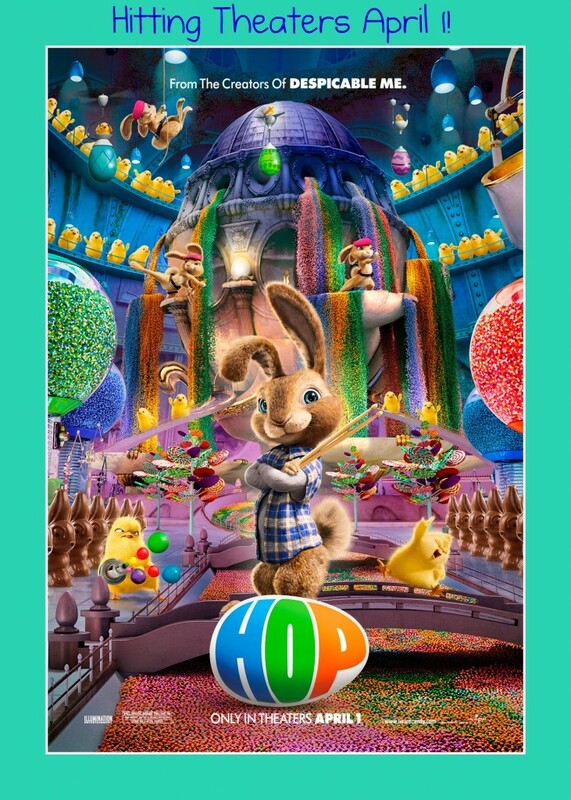 No not so we can pull pranks and not get in trouble for them (April Fool’s Day) but because Hop makes it’s way to theaters. Hop is the story about E.B. (voiced by Russell Brand), the teenage son of the Easter Bunny. On the eve of taking over the family business, E.B. leaves for Hollywood in pursuit of his dream of becoming a drummer. He encounters Fred (James Marsden), an out-of-work slacker with his own lofty goals, who accidentally hits E.B. with his car. Feigning injury, E.B. manipulates Fred into providing him shelter, and Fred finds himself with the world’s worst houseguest. Get your kids involved in the fun until then and head over the official movie site for fun and games or have some fun on Poptropica. Countdown to the release date of April 1 and then head to theaters to see the movie for yourself but don’t forget the kids! Follow A Daily Dose on Facebook Networked Blogs. Like Hop on Facebook let them know A Daily Dose of Toni sent ya! Leave a comment on as many non-giveaway posts as you want (1 entry for each, can do this unlimited times). Please leave which post you commented on in your comment entry. Giveaway will close on 4/01/11 at 8:00 p.m. CST. For more on my review, giveaway, winner, and disclosure policies please see my disclosure. * I was given a Hop prize pack to keep for myself. No other form of compensation was given. Reception of product does not have influence on my views. Opinions are mine and mine only. My favorite candy is chocolate malt balls. I love the jelly beans. My favorite easter candy is cadbury eggs! I have a couple….Russell Stover Pectin Jelly Beans and Robin’s Eggs….yummy!! My favorite is Rocky Road eggs from See’s. I like peeps and chocolate bunnies. My fave is Reese Peanut Butter Eggs!!!! My favorite is Peeps, also. Cadbury Easter Egg is for me! Mine is cadbury mini eggs. My favorite is chocolate peanut butter eggs. My favorite is Reese’s peanut butter eggs. My favorite is jelly beans. Thank you!! Cadbury cream eggs or chocolate covered Peeps! My favorite is Cadbury Eggs! I love peeps as well! I love Cadbury Eggs! Yummy! I like Reese’s peanut butter cups that are egg-shaped. Umm cadbury cream eggs! YUMMM!!! My favorite would be cadbury creme eggs. My favorite Easter candy is Cadbury Mini Eggs, I stock up after Easter when all the candy goes on clearence that way i can have them whenever I want! Like A Daily Dose on Facebook. My favorite Easter candy is the traditional chocolate bunny! I like malted milk ball eggs. I love Jelly Beans but really like peeps too, they make me sick though, lol. My favorite is Reeses Peanut Butter Eggs. I love jellybeans especially the white and the red ones. I follow on gogle frriend! My fav Easter Candy is Cadbury Creme Eggs! Delicious! I Like Hop on Facebook let them know A Daily Dose of Toni sent me! I Follow A Daily Dose on Facebook Networked Blogs. Chocolate covered peanut butter eggs! I love the idea of those temporary tattoos! I want in!